Note: As of Wednesday morning, the House version of the bill is back with the Senate, where lawmakers are fighting to resurrect their version of the bathroom bill (SB6), which would apply the restrictions on transgender bathroom usage to any public restroom in the State of Texas. For the latest updates, visit the Texas Tribune. After months of heated debate, lawmakers in Texas passed a bill last night that would prohibit transgender students in public schools from using bathrooms and locker rooms associated with their gender identity, limiting them to those associated with the gender listed on their birth certificates or single-stall bathrooms. The bill is expected to clear final passages in the House and Senate this week and head to Governor Greg Abbott’s desk this Friday. Some opponents of the bill call it discrimination on par with Jim Crow-era laws segregating blacks and whites. Supporters of the measure say it provides guidance to school districts and provides accommodations for all student groups. 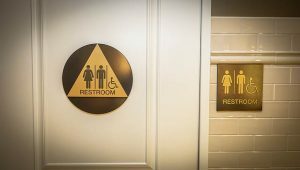 The measure approved by the House was narrower than Senate Bill 6, which would have applied these restrictions to public restrooms in any facility in Texas. As debate around that bill stalled, House members decided to tack the bathroom provision as an amendment onto Senate Bill 2078, which addresses school “multihazard emergency plans”, according to the Texas Tribune. The bill will now go back to the Senate. Critics, however, say the bill is discriminatory without question and will incite backlash, much like what occurred when North Carolina passed a similar bill.